One lump or a few hundred? Struggling to decide what to give your beloved on Valentine's Day? How about a couple of zip files stuffed with SampleRadar's high-quality, royalty-free samples? This week, we're offering you a selection of sounds that can be used to add an extra 'something' to your tracks. By that, we mean FX noises and sweeteners that will serve as the icing on the sonic cake (or, if you're more experimental, the egg and flour). The samples are split into ten folders. Nine of these contain FX sounds, while the final one (which is in a separate zip file) contains the sweeteners. As well as loops, some of the kits also contain hits. 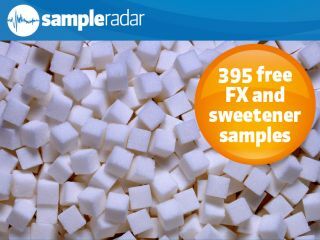 The FX and sweetener samples are supplied in zip files, so you'll need to extract them before you can see them. Enjoy!